“The following is a contributor post by the Bizzaro Mage“. I’ve done a few reviews for this wonderful site now and, I must confess, I still haven’t looked at a game from the 16-bit era. The Sega Mega Drive was (and always will be) one of my all-time favourite consoles – in fact, I still have it wired up in my cabinet, should the urge for some brilliantly classic gaming tickle my fancy. So, for my tenth review, I m going to buck this trend. And I’m not going for an obvious choice like Sonic the Hedgehog or Streets of Rage, either. No, I’m going for Konami’s platformer classic Rocket Knight Adventures. This game was released in 1993, the year in which Bill Clinton was inaugurated President of the United States, and was both developed and published by Japanese powerhouse Konami. Notable games that came out in this year include Mortal Kombat II, Starwing and Secret of Mana, all very famous and well-regarded titles. Rocket Knight Adventures was co-designed by one Nobuya Nakazato, the brains behind several entries in the (very difficult indeed) Contra series and was a Sega exclusive (even if it did gain a sequel on both the Sega Mega Drive and the Super Nintendo Entertainment System in 1994). The game follows the journey of Sparkster, an anthropomorphic opossum in the vein of many the 90s platformer mascots except he’s fully clad in steel armour, carries a wicked blade and wears a honking great jet pack on his back, allowing him to pull off some awesome aerial acrobatics. But was this tooled up, combat-ready rodent up to the task of taking on Sega’s big shot himself, Sonic? Was his titular adventure up to scratch? Does it hold up today? Let’s get some of these questions answered, shall we? Konami are (or perhaps were) famous for the amount of visual polish and fidelity put into their titles. From the atmospheric and grandiose world of Castlevania to the eye-boggling amount of little details and touches in the Metal Gear series, this publisher was not one to cut corners in the graphical department. You may be glad to know, then, that Rocket Knight Adventures is no slouch in this regard either. The game has a fantastically detailed and vibrant aesthetic to it that would charm all but the flintiest of hearts. Look at his adorable little face! And chicken! Any character platformer of this era is, I believe, only as good as its protagonist. Sparkster looks pretty fantastic overall, his blue armour looks chunky and heavy and you can really appreciate how weighty it must be as our hero moves, striding fervently across the levels with a look of determination on his cute little face. The pure physicality of his gear is also apparent when he jumps, for he lacks the floaty leaps of Mario or the crazy fold-into-a-ball jump of Sonic. 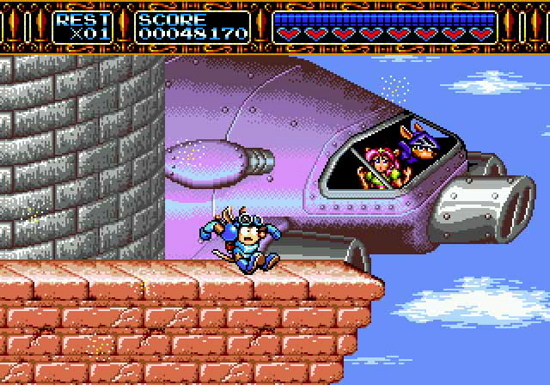 Sparkster’s jumps look like they take some effort, and this, combined with his gait, does really translate to the player the fact that the poor opossum is clad in full plate armour and wearing a gosh-knows-how-heavy rocket on his back. As for said back-mounted apparatus, it also looks pretty fantastic in action. When the jet pack is used in short bursts (as it is for 90% of the game) it looks fast, sudden and dangerous, leaving a trail of fire behind it and forcefully ricocheting Sparkster off walls and ceilings. The warrior himself holds his sword out in front of him and grits his teeth as he flies, all of that rocket knight training (which I’m sure he’s had) clearly coming into fruition and allowing him to (at least nominally) control his unusual mode of transport. 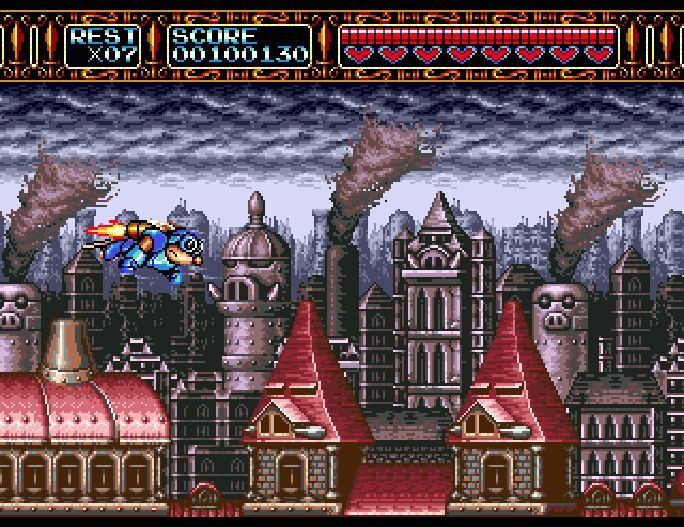 A couple of levels have Sparkster flying for their entirety, propelling him from left to right as he fights through clouds of enemies and avoids obstacles. During these sequences, our hero lowers his goggles – a small touch perhaps, but a pretty brilliant nod to attention to detail all the same. This level of detail and visual flair isn’t just limited to the lead either. King El Zebulos and Princess Sherry, though they have nowhere near as much screen time as Sparkster does, are still well detailed and are animated with plenty of personality, as are the evil Emperor Devilgus Devotindos and his motley gang of no-goodniks who are out to seize control of the Pig Star (yes, Pig Star) and squash poor Sparkster into the dirt. Top mention for the bad guys, however, goes to the evil rocket knight Axel Gear, who basically looks like an early 2000s version of the protagonist who spends all of his time in his room listening to Linkin Park and Papa Roach. Think a lot of black and purple and a fringe to die for (as worn by an anthropomorphic opossum) and you have Mr. Gear down to perfection. So the main cast all look grand, but what about the expendable mooks that one will be dispatching, the pig soldiers of the Devotindos Empire and their mechanical contraptions? Well, they range from good to straight up fantastic in appearance. Pig soldiers wear detailed armour in various colours, these colours denoting their difficulty and, one guesses, rank. Green-clad pigs are pretty easy to deal with, running at Sparkster with all the tact of a wild boar, whilst the red uniformed members of the pig army are wont to leap from one side of the screen to the other and, at a couple of points, even ambush the player from hiding places in the background. When Sparkster hits one of these porcine soldiers, they flee in terror, the sheer power of the rocket knight’s sword separating the poor fellow from his armour and sending him scarpering off-screen in his tighty whities, which needless to say is greatly amusing to watch. But pig soldiers are, undies or not, a mere aperitif compared to the vehicles and machines that they use in the battle against rodents in armour and rocket packs. The detailing on these machines is deep, well drawn and highly impressive. No shortcuts have been taken in the design of these enemy types. Bipedal walkers stomp through burning villages, jet skis roar over Sparkster’s head as he dives under the water and giant artillery shells fill the sky (one of which even has an unlucky pig soldier hanging on for grim death!) The finest machines of all, however, are the mini-bosses and end of level big bosses. The first mini-boss that one encounters is a tank designed to look, of course, like a pig. It has a stout cannon, caterpillar tracks and a big exhaust at the back and looks intimidating as hell as it rolls onto the screen. Every single end level boss also looks the part: a death-dealing machine built with the express purpose of squashing rocket knights. Whether it be a fireball-spewing giant piranha/submarine, a cannon encrusted train or a giant dancing robot that rains debris from the ceiling above, they all look detailed, scary and full of their own sense of character. That sense of character doesn’t stop at the sprites that inhabit the world of Rocket Knight Adventures either. The level design and backgrounds are also something of a visual feast, despite a few drab cave type levels being thrown into the mix. An example of a visually pleasing level would be the opener, that classic first level, which features endless fields of green studded with burning homesteads, sprawling trees, and steep cliffs for Sparkster to rocket his way up. In the background stands a castle, your destination, sat atop a huge rocky outcrop. Sat atop the castle itself, a huge spider-like machine, punching holes through its stout stone walls. This will, eventually, be the first end level boss of the game and this little visual clue as to what to expect once one reaches the castle is very well executed. Another fantastic example of Rocket Knight Adventures’ brilliant level of detail can be seen in the airship level. Part of this stage sees Sparkster fighting his way through the giant vessel’s engine room which, it turns out, is chock full of what appear to be exercise bikes, each one being cycled upon by a pig soldier (they’re even in traditional striped naval garb, so I guess the correct term would be sailors). Such is their level of commitment to powering the airship that they don’t even notice that their sworn enemy is slashing his way through their comrades just yards away from them – another wonderful little touch that was well worth the time spent animating them. Yet the best use of graphics in this game exists in but one, solitary platforming section that is merely a few minutes long. This section sees a river of lava rising and lowering rhythmically, revealing platforms for only a few seconds at a time and calling for some expertly timed jumps to avoid getting everyone’s favourite opossum fried by the red hot nastiness. Yet there is one more catch to this part of the game: banks of stalactites obscure the upper half of the screen, often causing Sparkster to disappear behind them entirely. In order to keep track of one’s progress, you must look to the lava itself, for it is very shiny and casts a pretty perfect reflection, an effect not often seen in many of the Sega Mega Drive games that this old gamer has played over the years. It’s surprisingly difficult to control what is essentially an upside down Sparkster as you watch the reflection instead of the actual sprite, and acts as a tough yet very inventive puzzle. My only other complaint, aside from those few drab looking levels, is that one of the more ambitious effects do tend to send my eyes a bit funny, making it hard to concentrate. I speak here of the game’s very first mini-boss, the tank that I used as an example earlier. Once enough damage is dealt to the machine, the bridge upon which it and Sparkster stand collapses, pitching them both into the river below. The next phase sees the tank paint-balling around in the current, with the protagonist trying to avoid it and deal even more damage to finish it for good. This would have been easier were it not for the effect used for the flowing water, which is so visually busy that it occasionally made Sparkster hard to locate in amongst it all, allowing the tank to get some cheap hits in whilst I peered into the chaos. This is, thankfully, the only occasion on which this happens and, whilst one cannot blame Konami for pushing the Sega Mega Drive’s hardware to its limit, I was glad that they didn’t try it again further down the line. Oh, and how could I forget to mention those wonderful, flashy, weighty 16-bit explosions? I could watch those all day! One element that always seems to stick in my memory way after a game is completed and put back onto the shelf (or indeed virtual shelf these days) is the soundtrack. Anybody who has read my previous work will attest that I always try and explain what I like (or dislike) about a game’s music, to varying degrees of success, despite lacking any (literally, any) knowledge of music. What I am trying to get at here is that Rocket Knight Adventures has an amazing soundtrack, easily in my top 5 of all time. The score was co-composed by Aki Hata, who composed music for many Konami and Treasure games, as well as for a few anime series. She also performs in the band Tsukihiko, which I can recommend also. 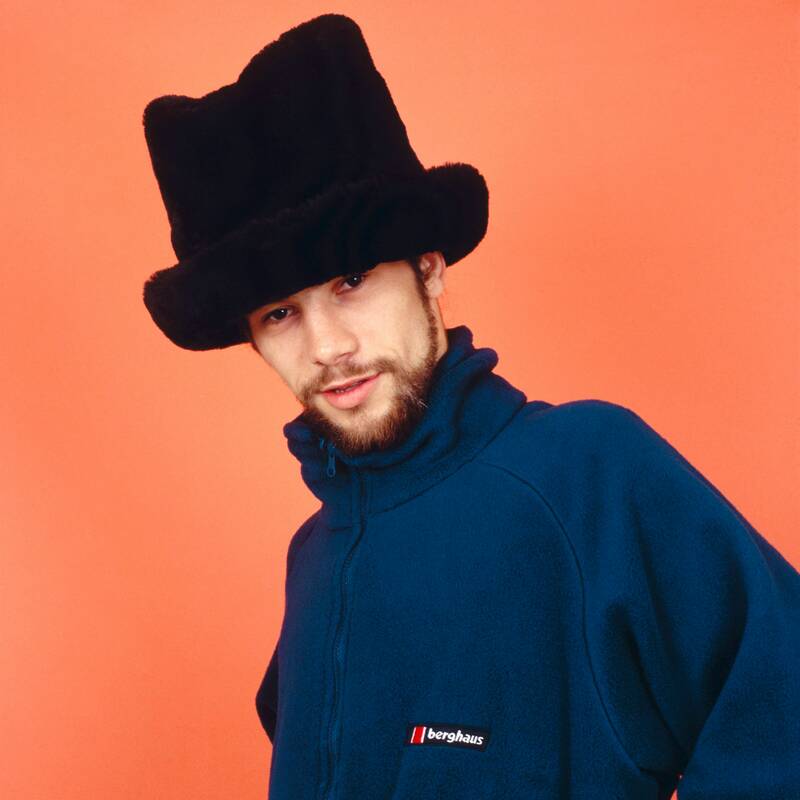 Absolute musical talent in human form? And my personal favourite, the game’s boss theme, which is easily my favourite from the Sega Mega Drive’s stable of games (I was going to say of all the 16-bit era but Magus’s Boss Theme exists, thanks Chrono Trigger). This theme especially really hits home a sense of shock and awe, painting the odds as very much against you as Sparkster takes on these giant killing machines. The general sound effects are also solid and do their jobs admirably. Sparkster’s sword swooshes satisfyingly and the echoing, almost-sonic-boom sound that the energy beams fire certainly sound like they’d give you something to think about if they hit you. Explosions are satisfyingly loud and the cute little scream noise that Sparkster makes as the airship’s exhaust blasts him away has etched itself into my very consciousness. In this writer’s lofty opinion, Rocket Knight Adventures stands toe to toe with anything that the Super Nintendo Entertainment System could offer, despite Sega’s hardware not quite being there in comparison, and is a real credit to Aki Hata and Konami as a whole. On its brightly coloured surface, Rocket Knight Adventures could initially be mistaken for any other of the million and one platform games available on the Sega Mega Drive, Super Nintendo Entertainment System or indeed any other console or microcomputer from this time period. It has enemies to thwart, floating platforms to navigate across and boss fights. Yet Konami packed far more than that onto its cartridge, for if one is to scratch this game’s surface, there is far more to be discovered. As I touched upon previously, there are a couple of sections in this game where Sparkster takes to the air, using his rocket pack for a long aerial combat section. The best way to explain this to those who know their retro games is “a bit like R-Type” but for the rest of you, allow me to extrapolate further. Our hero flies rapidly from left to right, with the player able to move him around the confines of the screen but never being able to make him slow down. He can use his sword’s energy waves to attack incoming enemies, which tend to attack in hordes and will test one’s ability to prioritise targets. There also tends to be a mini-boss in these segments which offer nice challenges under these temporary set of rules. The rocket pack isn’t just for these sections, however, as it plays a part in the general, more traditional platforming levels too. Holding down the B button will fill a gauge at the bottom of the screen and, once full, releasing the button and holding a direction on the D-pad will fire Sparkster in that direction like a missile, damaging any enemy he comes into contact with on the way. This move can be used to bounce the opossum from walls, ceilings and even the ground – a feature that comes in very handy in some of the more challenging platforming sections. Releasing the rocket’s charge without holding a direction will instead make Sparkster spin on the spot like a Catherine wheel, dealing massive damage to any fool daft enough to get into his range. As for straight up, non-rocket pack based combat, well – Sparkster has his powerful blade for that. Tapping the attack button will make him swing said sword, which not only hits any enemy stood right in front of him but also sends out an arc of energy, not unlike Guile’s Sonic Boom move from Street Fighter. This arc doesn’t travel far, hitting enemies maybe three or four times the length of the sword. This adds some range to one’s attacks and allows you to engage incoming enemies from afar. The rocket pack and sword are fantastic tools for helping Sparkster get through the game’s levels, as is his tail, which he uses to hang upside down from branches, vines and similar grappling points. A few sections of the game heavily encourage the use of this mechanic, breaking up the on-foot, left-to-right main sections of the game, as do the flight missions. I really can’t talk about Rocket Knight Adventures without mentioning its bosses, however (as I’m sure you’ve noticed). Not only do they look intimidating as hell and not only do they have one of my favourite pieces of video game music ever attached to them, but they all play out very differently. 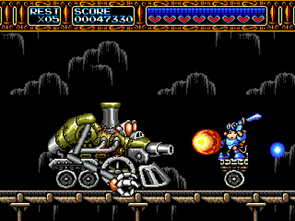 For example, one level’s boss is a locomotive, bristling with guns and telescoping clawed hands which chases Sparkster’s minecart, firing cannonballs at him and generally being a massive nuisance. Another is a giant, robotic facsimile of a major villain that alternates between firing energy beams from its chest and what I can only describe as gyrating at a very high speed like some mad, super-evil Jamiroquai, sending debris raining from the ceiling for one to try and avoid. My favourite boss, however, is a giant, three-or-four-screens tall mecha piloted by My Opossum Romance’s lead singer Axel Gear, which chases Sparkster through a maze – at its end is another mech, which the rocket knight boards and activates. What follows is a ridiculous mech boxing match, turning the usual boss fight rules on their head and delivering a very welcome surprise battle. You’re meching a terrible mistake! The mini-bosses are just as good too, featuring tanks, weird smiley eel things with red noses and a crab/submarine that, for some reason, is wearing boots. They all play out very differently and have their own set of rules. Konami really didn’t cut any corners with this one. Even outside of boss battles, the Empire has plenty of gear to throw at Sparkster. Whippy armed mechs, jet skis, bipedal walkers and cars full of smug looking pig soldiers are just a few of the enemies you will face on your journey, with many more to be found before you hit the credits. Rocket Knight Adventures takes the massively popular platform genre of its time and, unlike many games of the era that were happy just copying Sonic and Mario, chose instead to mix in different gameplay styles, unique skills and a massive roster of well designed enemies and bosses to be dispatched. They even added a pretty good story for a game of this type. For a 16-bit platform game on the Sega Mega Drive, Rocket Knight Adventures has a pretty well thought-out plot. Sadly, some of this is not made apparent in the game itself, instead existing in the game’s manual (remember those?) Despite this, the game does feature some pretty satisfying cutscenes and it’s quite easy to understand the events of the game despite there being no speech or text. The world in which the game takes place is called Elhorn, which contains the kingdom of Zephyrus, a peaceful land of plenty. A long time before the game begins, Zephyrus was invaded by a mysterious people, who fought from aboard a floating death station called the Pig Star. Despite heavy losses, the good guys beat their would-be oppressors and sealed the Pig Star away under a magical spell, unlockable only with a special key which was passed down from king to king. Many enemies sought the power of this terrible weapon and so Zephyrus was forced to create an elite cadre of warriors, the rocket knights. Sparkster is the leader of this unit, promoted after a rogue member of the unit, Axel Gear, killed their former master. Our hero vanquished Gear into exile and all seemed to be well. That is until the nearby Devotindos Empire attacked. Backed up by advanced technology, their onslaught seemed to be unstoppable and Sparkster hurries to the castle in order to protect the king and his daughter. The game begins at this point, with Sparkster failing to stop a resurgent Axel Gear from kidnapping the princess and being forced to give chase right into the heart of the Devotindos Empire itself. The final battle that awaits him in outer space and the reveal of the game’s true big bad really surprised me, a truly masterful twist that came out of nowhere. It’s a fun little story. Even if you don’t get to hear about the world and its history too much in game, those well animated cutscenes will still keep you interested throughout. When I was 10 or 11, I found this game absolutely solid, falling time and time again within a couple of levels of the finale, desperately clawing back every inch of health to survive against those boss battles. Twenty plus years and I wish I could say that it has become easier to keep Sparkster alive for long enough to see the fall of the Devotindos Empire, but that is most certainly not the case. 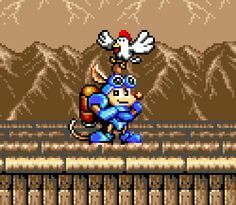 Rocket Knight Adventures is a difficult game which punishes mistakes harshly and, at many points, demands some precision platforming in order to keep the heavily armed opossum alive. This is no more apparent than when you are fighting against bosses and mini-bosses, many of which require constant and speedy movement to avoid taking a ton of damage, all whilst delivering attacks of your own intense battles of attrition that can last for a good while. The only part of the game that seems to let up on the difficulty is its flight sections. As fun as they are, they certainly lack that “one wrong move and you’re toast” feel of the more straightforward platform levels. It doesn’t always seem fair, however. I played this game again recently, in order to write this review, and quickly remembered just how unresponsive Sparkster’s rear mounted flight device could be. I lost lives on several occasions thanks to the furry idiot launching himself in the wrong direction (I swear I was pressing the D-Pad diagonally!) or just performing his spin attack. The boss fight I mentioned earlier, in which a giant mech is chasing you through a maze, really used to ruin my playthrough as the daft opossum launched in the wrong direction and got crushed for his efforts. Apart from this little foible, however, Rocket Knight Adventures remains fair in its unrelenting quest to crush the last rocket knight into a fine paste. In all the years I’ve enjoyed this game, I’ve only ever beaten it once. Rocket Knight Adventures is, like many games of its era, all about replay value. It’s a well-known fact that, due to cartridge limitations, most 16- and 8-bit games weren’t massively long, instead relying on difficulty and/or a password system to keep players coming back. Whilst there were exceptions, such as cartridges with save functions like Super Mario World and Sonic the Hedgehog 3, Rocket Knight Adventures is more in the former bracket. That is to say that it’s relatively short and, as previously mentioned, as solid as Axel Gear’s well styled fringe, a combination that kept players coming back again and again in decades past, well before memory cards and cloud storage. That sense of “this time I’m going to smash it” is an addicting one, making beating the game a personal mission. That said, this game’s harsh difficulty did put me off jumping back into it a few times, that “one more time” feeling mutating instead into frustration at once again hitting game over just because Sparkster’s rocket pack failed to send him in the right direction. Despite this frustration, however, there is something very addicting about playing this game and it’s kept this (admittedly talentless) gamer coming back again and again for over 20 years. How many platform games from the early 1990s let you soar through the air on a rocket pack, survive a super-high speed minecart section, use your reflection upon a shining pool of lava to find your way safely forward and have a literal fistfight with a giant mech, using your own giant mech? Probably not that many, I shall warrant. Glibness aside, Rocket Knight Adventures does enough to keep its gameplay fresh throughout by often changing up its mechanics and each boss encounter is always radically different to the one before it too. Sparkster’s own moves and, of course, his rocket pack leaps are also something that not too many games of this era can show off (how many platformers only feature a jump move as an attack, for instance?) and many levels introduce technical rocket jump puzzles in which to use this mechanic, making it a key part of the overall experience. Rocket Knight Adventures is a solid 16-bit platformer which is made all the more engaging and unique thanks to some ambitious moves, traversal options and variations in game types, keeping it floating atop a morass of otherwise forgettable mascot platformers that bloated this console generation terribly. The 90s was, for myself and many other gamers, a formative time, discovering what we did and didn’t enjoy in the vast world of video games. My dad (ever the gaming legend) picked up a copy of Rocket Knight Adventures from the local used game store because they didn’t have Sonic the Hedgehog 3 in stock and my brother and I were particularly bored/annoying that summer holiday. That desperate move to buy our silence until school resumed was a great move on his part, as this shot in the dark turned out to be one of the greatest video games I’ve ever played. I might even go as far as to say that it surpasses Sonic the Hedgehog 3 anyway. Its mix of chunky, colourful graphics, stellar soundtrack and challenging, varied gameplay is truly lightning in a bottle, let down only slightly by those times when cheap deaths get on top of you and put you off picking up the controller for a few days, opting to play some easier game instead (like Sonic the Hedgehog, for instance). It even has a pretty fun story that features an epic endgame twist, sure to make you drop your 90s memorabilia in surprise. And those bosses, oh my goodness, those bosses! Loved the passion for this game in your review. I also never played this, but your review has me believing I truly missed out! Especially since I love a good boss fight, which this sounds like it has in full. I do have one serious question. Is Sparkster’s tail fireproof? How does he keep it from incinerating from the heat thrust from the jet pack? That is a great question! Maybe it’s a secret passed from one Rocket Knight to another? Fun read, your enthusiasm for the came really came through! I’ve never played RKA though everyone who has says it’s great. It really is one of the Mega Drive’s best, definitely worth a play in 2019! Of of the first games I got when I started collecting Genesis 12 odd years ago. Stands as my favorite Genesis game. Konami was on their game back then. Oh definitely! Considering it was an “instead of Sonic” purchase it’s really stayed with me over the years! I’ve not played this, but it looks incredible. Definitely not as drab as some Genesis games were. It’s bright and it looks really animated and colorful. I’d definitely agree with that, it’s well worth a play! And the music is top drawer! This was actually one of my favourites, and in my opinion, an example of the console at its best. Plus, it’s a cute steampunk opossum. What more could you want?